Hello! Eek so we've got something pretty exciting today, if you read my blog frequently, you'll see how often I rave about Benefit's products, they really are taking over the beauty world with their fabulous new launches and super exciting,active social media presence. So now I'm back with another Benefit review, something which I literally couldn't wait to review. Also, I'm going to tell you how you can get a gorgeous new set of brows, shaped by the lovely ladies at Benefit and help charity at the same time. Today is Benefit's official 'Brow Arch March' day, their answer to 'movember' and I'm excited to tell you all about it! So before I get on with the review, I just want to tell you a little bit more about Brow Arch March, this is a collaboration between Benefit and Debenhams in support of Look Good Feel Better, you can support this great cause by getting your eyebrows waxed and shaped at your local Debenhams for a suggested donation of £5 with all the money going to charity. Benefit are making sure that they shape millions of brows throughout March in order to raise money and awareness for Look Good Feel Better, a cancer charity which focuses on problems associated with the visible side effects of cancer treatment. I know that I'll be heading to my local Debenhams to get my brows done this week! So onto the review. At first, I was kind of like, hm this is a bit of a pointless product, I wasn't really bothered by it, but I've been using it every day and I've got to say, I couldn't not have it in my make up bag now. This makes doing your brows super easy, I'm not very good at shaping my brows with just a brush or a pencil, I either do it too dark, or get the wrong shape. Gimme Brow makes faking the perfect brow easy, the gel literally glides on and you can easily build the shape that you want just by moving your hand in the right angle. The packaging makes this product even more perfect, it's so light and little, it means that you truly can just throw it in any bag and not even notice that it's there - this is a very portable item, very travel friendly (perfect for me as I am flying to Vietnam in 20 days!) I also like that the packaging is quite neutral, sometimes Benefit packaging can be really bright, which is fine but my make up bag is quite dark so it's nice that this will go well with everything else in my bathroom. It is very natural looking, it doesn't 'paint on' as such, it goes on and just looks like your hairs are thicker, I was expecting it to be quite thick and paint-like and give quite a 3D finish, but it just enhances and fills in your natural brows. I do think this is really long wearing, it's lasted at the gym after a 2 hour work out and it certainly doesn't drop down my face on a night out in a club. This is very build-able, you really can play around with the shape and colour. In true Benefit style, they give you a tips and tricks booklet, so if you're not that confident with doing your brows, this should help. I know it helped me. The brush is the perfect size, it means that it's hard to go wrong when shaping the brow. I find that this brush it really easy to use too, its very user friendly. I tested out both shades, Light/Medium and Medium/Deep. I've personally been wearing the Light/Medium one but I think once I've put some fake tan on and on a night out, I'd wear Medium/Dark. The light shade is the perfect day time brow for me, it's very natural, if I was going for more of a full face of make up look and wanted darker brows, I'd wear the dark one on a night out. I thought the light shade would be really too light but it's actually not, it fills my brows in really nice and I have quite dark brows. Benefit kindly sent me this product but as always, my review is 100% genuine and I blooming love this product! 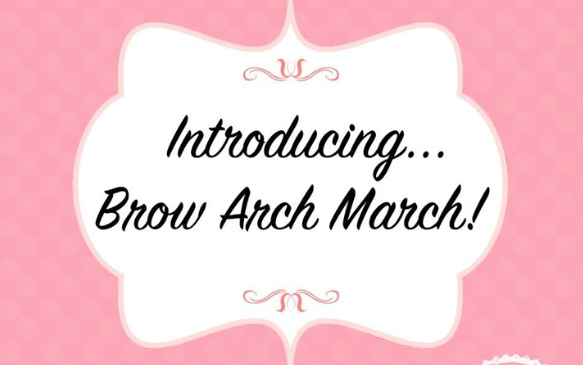 Will you be getting your eye brows styled this Brow Arch March? Have you ever used a product like this? Do you own this product? Would you be interested in using this product? Are you big on doing your eye brows or do you just leave them like I used to do? I buy the MAC eyebrow gel which looks very similar to this!! ooo im gonna go check that out now - thank you! I'm the same way when it comes to my brows. I've just never been able to master using a powder, etc. Gimme Brow has been a holy grail product for me since it came out last year! A friend of mine tried this recently and really loved it. I use something similar from Blinc that I absolutely adore. Great review! yay thats good to hear other people are loving it - will check out the Blinc version now! thanks for the heads up! I want to proove it right now!!! haha let me know if you love them as much as i do! Will be going straight to Debenhams now, really want to try this out now! I have these I love them, the darker one suits me best but I have pretty dark brows. I currently use browzings from benefit but may have to try these next! This looks quite good.. I'm rubbish at doing my eyebrows! yeah me too and this makes it much easier!